Dyslexia London had the great opportunity to sit down with the wonderfully talented and incredibly hard-working illustrator and comic artist, Lyndon White. He shared his experiences of having dyslexia, and how he overcame them to become one of the most renowned names in the comic industry. How old were you when you found out you had dyslexia and how did it come about? I was really late finding out as I didn’t know until I was about half way through my first year at University. I was 19 at the time. There’s a large percentage of people who have some form of dyslexia in the arts. Or at least, this was the case at the time I studied at Glyndwr. Early in the course, they pointed out that the vast majority of us might have some form of dyslexia as it becomes quite common with the people who take an art form to degree level. Our tutors recommended we signed up to be tested. Myself and bunch of friends signed up to take the test with a department at the University. As I did certain parts of the test, the moderator would mark as I did the next section. By the end of the test the moderator informed me that I was dyslexic and I would receive a full report with all the details in a week or two. I did ask the moderator at time, why has it’s taken so long to find out? How have I gotten to degree level and no one had pointed it out? He simple asked what I was like in school. Did I work hard? Was I well behaved? Did I get good grades? All of which, was yes. His response was that unfortunately, if you are a child that is working hard, getting on with the work and not acting out, or being difficult, you get overlooked. Especially if you are already doing well and a little quiet. At time I was a bit frustrated and felt let down that no one had spotted it sooner. Also, all my friends who took the test found out they had dyslexia. In what ways has having dyslexia shaped your life? Since I found out quite late, I’d naturally created ways to make things easier for myself. Typing on the computer rather than writing things out was a big thing. I’d submitted work digitally or printed form whenever I could. However, being aware of it has really helpful. I tend to find the pattern or rhythm of things. Knowing that I can read a piece of my writing multiple times and then days later, realise that I’ve swapped the letters or words round. To someone without dyslexia, this would stand out, but to myself, my brain corrects it naturally when I read it. Making mistakes like this difficult to spot. Simply knowing these things and being aware of them helps me know to look out for mistakes and check things multiple times. What support did you receive to manage your dyslexia? There was a scheme with the University to get free equipment and software. I got a printing allowance to allow me to print things out and not suffer the costs of doing so. There was also a book allowance to encourage reading which I think was incredibly important. You could also get extra time when doing written assignments and bookable appointments with a staff member to help you, but I preferred to be on top of deadline so didn’t use these. Overall, the University was fantastic at supporting students. What difficulties did you face with having dyslexia and how did you overcome them? A big one for me is spelling and switching words around. That can be quite difficult if you have important emails to send or if you’re working on a comic script. I work for myself, so there’s not always someone to double check these things. I often say the sentence out loud or get my computer to speak out the email or sentence. That way I can listen for any errors which can be easier to spot. Are there any difficulties you still struggle to overcome and what strategies do you use to manage these. I’m pretty confident with everything at this stage. To be completely honest, I forget about it. When I spot something that clearly isn’t correct, it reminds me that I am dyslexic but I don’t let it stop me day to day. Forms can be difficult because there tends to be a lot of text with important information. So there’s a slight pressure of not to mess these things up. Generally, with how things are layed out, things can move or words get switched around. What strategies do you use to manage your difficulties? I re-read the forms and documents at least three times before I start doing anything. I’ll also spend longer reading them than the average person just to make sure I’ve taken everything in. I’ll also scan or print out a second copy of forms or documents. One to fill in as I go, then a second as a final, neat version. If I get it right first time, great! If not, I have the second version to correct any errors I spot. What strengths do you have that those without dyslexia may not have? To anyone who is dyslexic, treat it as a different way of thinking, rather than some form of disability. Your brain works a bit differently to other people, use it to your advantage. You can spot things that others might overlook. Yes, I found out I was dyslexic quite late. Yet when I found out it made so much sense. I see the patterns in story structures, the pace of films, the steps to how a painting is made. It helps me understand how they are created, which I can then apply to my own work. Where does your work draw inspiration from? I got taught to look at everything. Which is very broad but does help. The majority of my work is comics based but I do look at as much as possible. I absorb every genre as long as it’s a good story. I read, watch films, l’m a big lover of music and go to gigs, I see plays when I can. Different disciplines tend to help develop ideas or skills that you can apply to what you’re working on. The more focused stuff tends to be things at are a little surreal or psychological, but it does depend on what mood I’m in. One day you find me reading a Stephen King book, another I’ll be watching Adventure Time. What inspired a recent idea? My recent graphic novel is called Candles and is being announce at The Lakes Comic Art Festival, with Unbound. It’s about a young girl’s quest to steal magic from an evil Witch and use it to save her dying village. The idea came from Winter last year. I’d recently moved and at night it’s pretty dark in the area. From the windows of our house, you can see trees in the distance and at night, there’s these small lights that look like they are floating amongst the trees. When I first saw them, my mind wandered and thought they must be floating candles. Which is visually interesting and started the idea for the book. The boring side to it, is if you look at the same spot during the day, you can see a large house through some of the gaps in the trees, which creates the lights and not some magically floating candles. Is there anyone who may or may not have dyslexia who inspires you? Not partially. I was already down the comics and graphic novels path when I found out. In high school art was my favourite subject and it was a bit of a hit when I found out I was partly colour blind. Which to some, would stop them doing some aspects of colour artwork. I wasn’t going to let that stop me and learned ways to work with it as I went on. I had the same mind set with dyslexia, so I didn’t anchor on someone to inspire me. Candles is my main project for a while, graphic novels take time to make. There’s a few other potential projects after or during the process of working on it, but nothing to talk about at this stage. I teach part of the comics module course at Salford University during November and December. So that will be starting up soon. I see myself continuing to telling stories. I love comics as a medium and as a form of storytelling. Being able to tell different stories and work with different characters is incredibly fun. Telling new stories, working with different people and publishers. It’s all different from book to book. I think doing something with Marvel or DC at some point would be fun, even if it’s just a one shot. I could have a lot of fun with one shot Batman story. Travelling would also be cool. My work setup is quite practical so I can take my work anywhere. Where do you see the broader dyslexia community heading in the next 20 years? I’ve seen people starting to change their mind set around it. Getting rid of the stigma of it being a burden or something that can hold you back (which, yes it can). Explaining to people that your brain works a different way is a much more positive approach. What advice would you give to someone with dyslexia who may be struggling to pursue a dream? My partner is a teacher and kids can sometimes get in their own way and limit themselves by using dyslexia as something to hid behind. “Your task is to write a story” with a response of “I can’t do it I’m dyslexic.” “Here’s a spelling test.” “I can’t do it, I’m dyslexia.” As soon as say throw “I can’t” you are stopping yourself. I understand it will be hard at times and reading can be difficult. I would make sure you utterly love what you are pursuing. Try to get better, work at it. To everyone’s annoyance the success part tends to come later. Just keep going and don’t be afraid to ask for help if you need it. Also read more. It does help. Just make sure you are reading the kind of stories you enjoy. You can find myself and my work at my website – www.lyndonwhite.com or through Facebook, Twitter and Instagram via @lyndondraws. Where can we get hold of your work? You can go directly to my website and each project should point you in the right direction. Otherwise check out Blue Fox Comics and Hellbound Media. They’ve each put out a few of my books. Any last words for the dyslexia community?Don’t let it hinder you, ask for help when you need it and keep moving forward. Lyndon grew up in Burnley, a small town north of Manchester. He did a BTEC National Diploma in Art in college which covered a broad range of different art forms, from fine art and graphic design, to sculpture and textiles. It’s the equivalent to doing around 3 A levels, but all in Art. 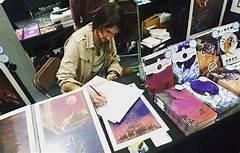 After college, he studied at Glyndwr University (North Wales School of Art & Design), where he took their course in Illustration for Graphic Novels. He worked in retail for 5 years while studying. While freelancing he was lucky enough to work in an Illustration, Graphic Design and Textile Studios for different periods of time, depending on the project he was working on. His interests and hobbies include comics, reading, films and TV, gaming, cycling and music.